Dr. Dog usually stays in their comfort zone making ramshackle, low-fi psych goodness. But The Psychedelic Swamp really mixes things up. Taking their (very rare) cassette-only EP from 2005, also named Psyhedelic Swamp, they dismantle it, chop it up, mix in new recordings, and use bits of chewing gum and school glue to piece it together. The result is a goofy album that feels like a weird collage, bouncing up-and-down in lunacy and having a good time doing it. 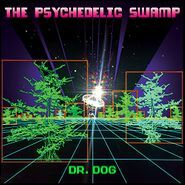 The oscillating synths and a more polished production give the album the depth of modern pop, adding a kookier and moodier atmosphere that Dr. Dog's freak-outs needed. The root of Dr. Dog's greatness is still there with the drunkenly joyful guitars and disorganized-ish jam sessions where the joy and silliness of their music and lyrics pops out. The album takes strange detours too, with a spoken word interlude erupting the flow with strange poetry, "Badvertise" with its razor sharp and almost satiric edge, and "Bring My Baby Back" which feels like later-day glam. With an airy, light quality, Dr. Dog's brand of psychedelia is the frothier, sweeter version of modern psych that gives you space to breathe and silliness to laugh with.